Gerry passed away peacefully at home in Winnipeg on May 4, 2014 at the age of 93 years. Beloved husband of Norma Frances Mulcair (née Young); married September 27, 1952 at Ascension of our Lord Catholic Church in Montreal. Beloved children Kevin (Kathy), Frances (Samad), Patricia (Daniel), Deirdre, Rosalind (Donald), David, Rebecca (Grant) and Margaret (Paul). Dearly loved grandchildren David, Maura, Erin, Andrew, Heather, Arthur, Philip, Angela, Ian, Tyler and Kathleen. Dearly loved great-grandchild Zayin. He is also fondly remembered by his sister Viola Hirst as well as many nieces, nephews, extended family and friends. Predeceased by his brothers Pilot Officer Kevin Mulcair, Royal Canadian Air Force (RCAF) in 1944 and Philip Mulcair in 1964, both of Montreal. Born on October 30, 1920, son of John and Viola Mulcair (née Scanlan), Gerry grew up on Marlowe Avenue in Montreal and served in the RCAF as a navigator. 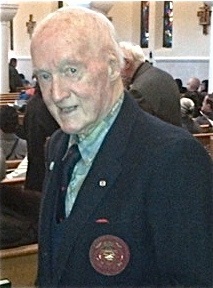 He graduated from McGill Medical School in 1948. He worked as an obstetrician at St. Mary’s Hospital, Montreal until 1982 and then briefly at Canadian Forces Base Cold Lake, Alberta before retiring to 29 adventure-filled years in West Kelowna, British Columbia with his beloved Norma. Gerry was an active member of Our Lady of Lourdes Catholic Church, West Kelowna and the Knights of Columbus. Among many roles, he is fondly remembered as an avid family camper and canoeist, amateur construction engineer and carpenter, constant veggie gardener, quiet volunteer and crossword master. Special thanks to Dr. Bruce Martin, Lana and the Palliative Care team for their care and support and to daughter Rebecca for her constant devotion and unending assistance during the past several years. In lieu of flowers, donations may be made to Chairs for the World at St. Gianna’s Catholic Parish, 1353 Kenaston Boulevard, Winnipeg, Manitoba R3P 2P2 (//www.stgianna.ca/chairs-for-the-world). Prayer Vigil from 2:00 p.m. to 4:00 p.m. Friday, May 9 at Bardal Funeral Home, 843 Sherbrooke Street, Winnipeg. Funeral Mass at 1:00 p.m. Saturday, May 10 at St. John Brebeuf Catholic Parish, 1707 John Brebeuf Place, Winnipeg. A private family interment will be held at a later date.